The UN has described the current crisis in Syria as the world’s worst refugee crisis for twenty years. There are now more Syrians displaced than any other nationality in the world. Chris Roles, Age International’s Director, reports from Jordan. More than 2 million people have left Syria – half of them in the last six months alone. Within Syria itself, a further 4 million have been displaced from their homes. Our supporters have responded with such compassion and incredible generosity, but this crisis isn’t going to go away – and it won’t be healed overnight. 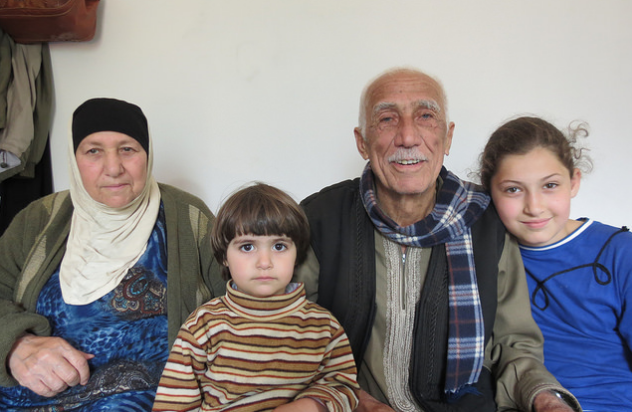 I recently visited Jordan, for a view on how older people are coping – and to see for myself how your donations are helping older Syrian refugees. I began my journey in the Za’atari refugee camp. Many refugees who crossed the border into Jordan have ended up here. It’s a sprawling area – so large, it’s now become Jordan’s fourth largest city – a city of tents and caravans in the middle of the Jordanian desert. Inside the camp, food and water (4 million litres each day) are distributed to 130,000 people every day. On that scale, even a simple task is a huge undertaking of logistics and resources. Perhaps it’s no wonder then, that older people are finding it difficult to reach health clinics. Some feel unsafe when they try to walk to the toilets at night. Many are isolated and lack opportunities to meet other people – an act which, although simple, is crucial to the healing process. Despite the difficulties, programme staff are working hard to search out the most vulnerable and isolated people in the camp. I met with those making regular visits to provide support and practical help – often providing an essential lifeline in the camp for those older refugees. This includes programme staff working for our implementing partner, Handicap International. Together we visited a 70 year old grandmother who struggled to reach the camp toilets. Handicap International gave her a commode – it was amazing to think that something so simple could have such an impact on a person’s life. Za’tari refugee camp in Jordon. 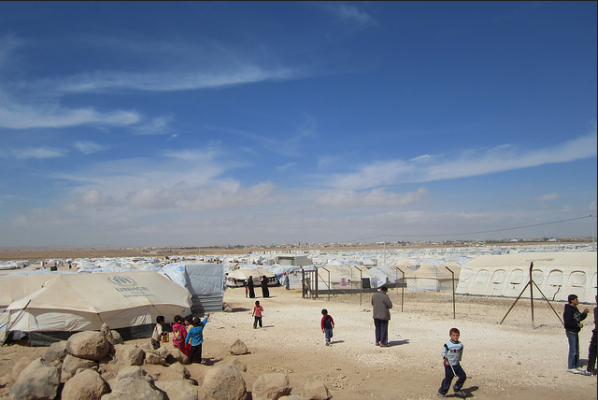 Beyond Za’atari camp – which is twice its original intended capacity – a new camp called Asraq is due to open soon. Asraq has the potential to become as large as Za’atari and those refugees who make their way there will find life very challenging in the inhospitable desert terrain. 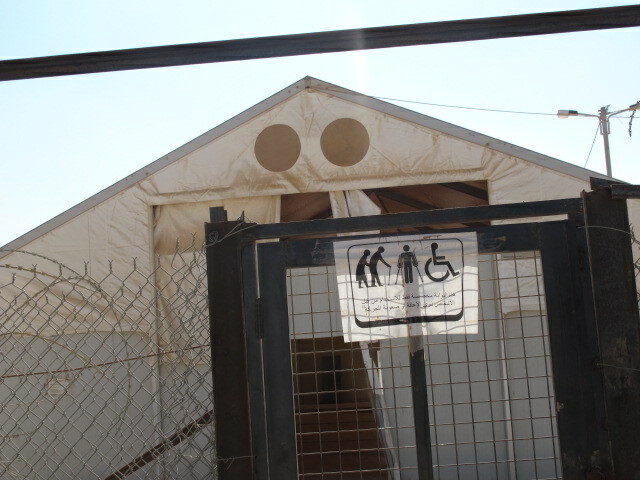 However, learning from the lessons of Za’atari, our local partner HelpAge is working closely with UNHCR and others to make sure Asraq camp will be be more age and disability-friendly, and to make the provision of community activities more likely. This is a crucial part of our strategy – working to influence the many agencies who are working with refugees, in both Jordan and Lebanon, to ensure that their staff are trained to identify and respond to the particular needs of older people. 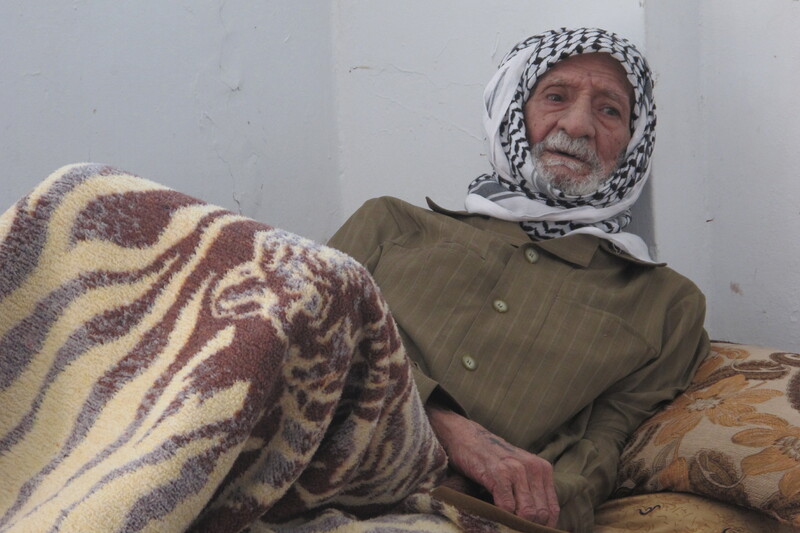 By helping to design the camps with the needs of older people in mind, as well as training agencies to identify and meet the needs of older people, and finding and providing practical help and support to the most vulnerable – thousands of older Syrian refugees are being helped. Many refugees in Jordan are not living in these camps – but are dispersed throughout towns and cities, finding accommodation where they can. Mohedin, a 72 year old man I spoke to, used to be a tailor in Damascus, Syria’s capital. He owned his own shop in the city. He was walking down the street to buy vegetables when a shell exploded in the street near his home. He lost his leg. Now, like three quarters of the refugees that come to Jordan, he lives in one of its cities – where, due to the huge influx of people, rents have escalated and living conditions are poor. These refugees are among the most vulnerable and the least visible – they do not have access to the services provided in the camps and it can be difficult to find them and offer them the help that so many of them need. This Syrian refugee family are living in temporary shelters, they are still waiting to be officially registered in Lebanon. Mohedin has been fitted with a prosthetic limb, courtesy of our partner Handicap International. He shows me his new leg, and becomes very emotional. He is able to walk again, unsteadily for now, but learning to walk a little better every day. But he still feels confused and ashamed by what has happened to him and he feels worried about how others may now look at him. ‘I feel ashamed to have been disabled in this way’, he tells me. Mohedin has, understandably, lost a lot of confidence. When I visit him, he has not been outside for many weeks. But I see the close rapport that has built up with the Handicap International worker who speaks words of encouragement and respect. This is just one life, one family slowly re-building itself. When I started this trip, I wondered what – given the magnitude of the situation in Syria – could be done to help the Syrian refugees. It’s easy to feel as though we’re a David, in the face of a Goliath. But your donations are making a difference. Thanks to you, we’re finding and giving practical, financial help to thousands of vulnerable older people – those who have lost everything in the conflict and have no money to pay for rent, food or medicine. By working to influence the many larger agencies working with refugees, we’re helping to ensure that they can meet the needs of older people in the most appropriate way. As Mohedin takes part in his physiotherapy exercises, he turns to me and says: ‘In future, I’m hoping that – with support – I may be able to walk again’. We aim to be with him, and the many others like him, each step of the way.